It feels like it’s been while since I shared a healthful pure vegetarian recipe. Or maybe I need a break from all the Halloween treat stuff I've been working on. Either way, I'm ready for soup season. 1. Heat oil over medium-high in an extra large pot. Add onions and cook until tender and start to brown. Deglaze the pan with wine. 2. Add the rest of the ingredients. Bring to a boil; reduce heat and cover. Cook until rice and broccoli are tender, about 30-35 minutes. 3. Puree soup with a blender in batches. Return to pan, add more salt and pepper if needed and serve. I was just saying to myself how much i miss soups. yes i talk to myself. soups give us an excuse to indulge in good bread. Thanks for sharing vegetarian recipes. People like me appreciate it! I love soups! Now that the cool weather is here I'll be making lots more of them. 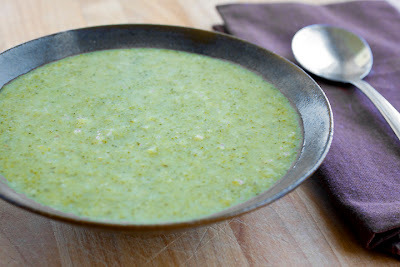 I bookmarked this recipe- healthy soup is exactly what I'm going to be making! I'm always ready for soup...especially creamy but not "cream of" soups! This looks great! This soup is right up my alley! I looove stuff like this. I could eat a gallon of this - yum! !